Britain's Frank Buglioni lost a unanimous points decision to champion Fedor Chudinov in their WBA 'regular' world super-middleweight title bout. The brave Londoner was outclassed as the Russian won the contest 120-106, 118-108 and 117-109 at Wembley Arena. Buglioni's cause was not helped when he was deducted two points for landing a punch after the bell had sounded in round six. "I gave it my best but the better man won on the night," said Buglioni. "He's a very good all-round fighter. I'd love to fight him again." 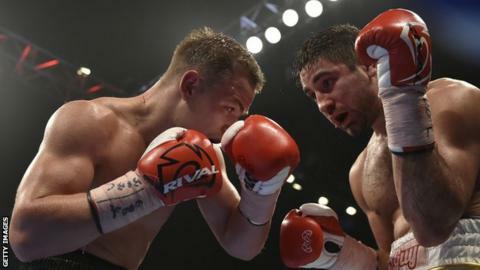 Buglioni, 26, trained by former world champion Steve Collins and his brother Paschal, was worn down by his opponent's relentless accurate punching, but refused to be give up and gave Chudinov a harder contest than many people expected. On the undercard, Lincoln fighter Bobby Jenkinson shocked strong favourite Lewis Pettit to claim the vacant Commonwealth super-bantamweight title with an 11th-round stoppage. Cromer's Ryan Walsh claimed the British featherweight title with a split decision over Hull's Samir Mouneimne.